Our next door neighbors and good friends are welcoming a baby in December. A couple of weeks ago they had a gender reveal party and decided to wait to find out themselves til the party. 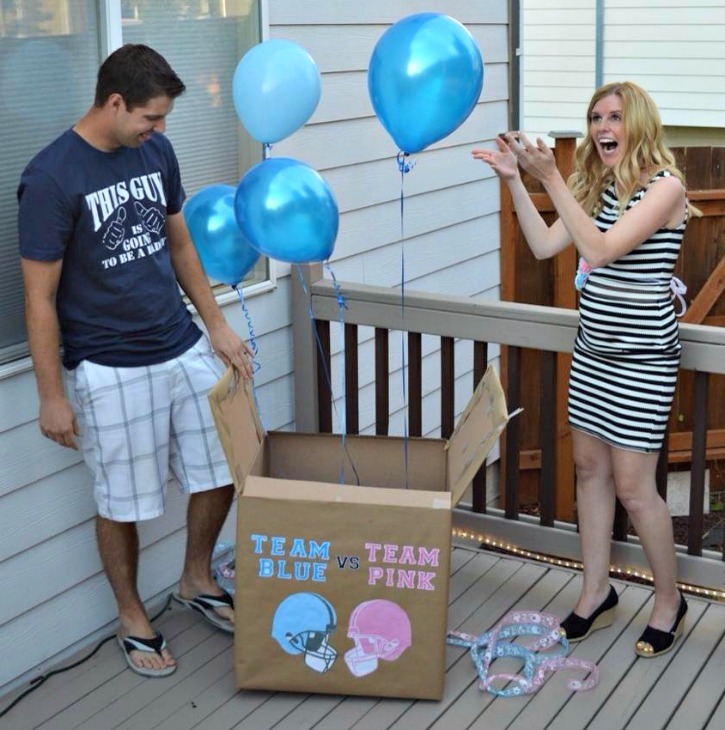 I was in charge of putting together a gender reveal box with balloons and had such a fun time doing it. I mean, how many other times in life do you get to know the gender of your friends’ baby before they do? Throughout the party, everybody tried to get me to slip on what they were having. I was good and didn’t let anybody else know what the gender reveal would reveal until they opened this awesome gender reveal box idea. 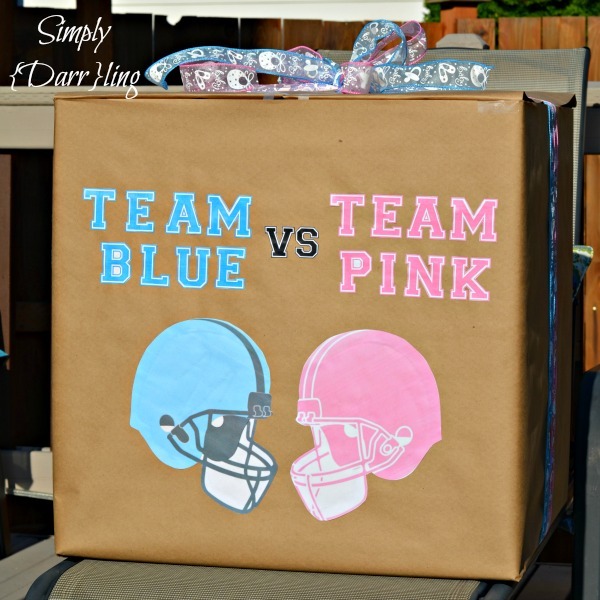 If you are looking to make this DIY Gender Reveal Box yourself, first congrats! Second, it is actually really easy so don’t be intimidated at all. First, assemble the moving box by taping the bottom. Tape one end of the kraft paper roll to the box, align the edge of the roll with the fold of the lid. 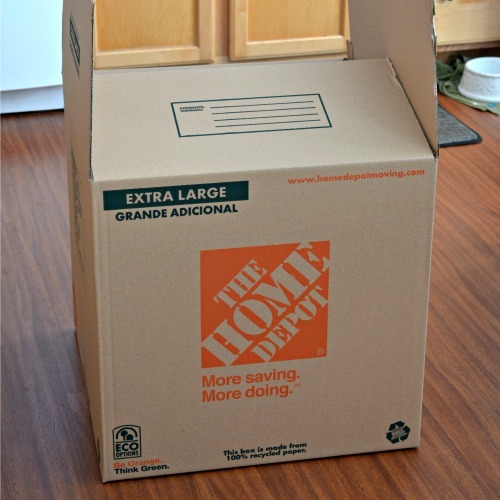 Rotate the box, wrapping it with the paper. Add some tape every once in a while (roll the shipping tape in order to make it “double sided”. 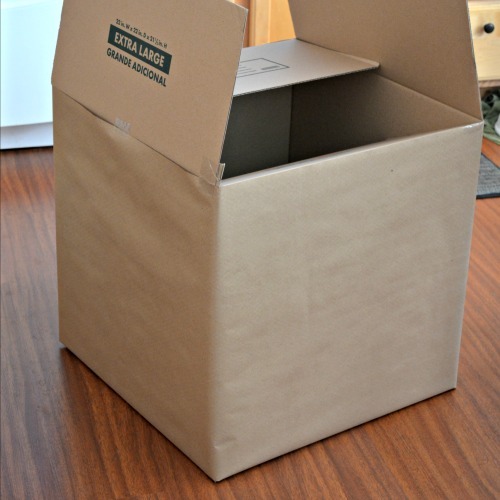 Overlap your starting point by a few inches, cut the paper off the roll, fold over the end and then tape it to the box. Flip the box upside down and then tape the overlap to the bottom (kinda like wrapping a present). Cut pieces of the kraft paper to cover the flaps and tape those down as well. I created the layout for the box in Publisher. Kevin and Renee had a football theme for the party so I used Varsity font for the lettering and found some helmet clipart images for the decoration on the box. I was able to find images that were already a nice light blue and light pink which was convenient. Once it was all laid out, I printed it and cut out each letter and image. It probably would have been a lot simpler to use the print and cut function on my Silhouette, but it was easier to just cut them out than learn how to print & cut at the time. Once all of the items are cut out, glue them onto the front of the box. Make sure that the flaps to the right/left of the box for ease of securing it close and also for pictures when opening. You can see below how you want the ribbon to go along the sides of the box rather than the front/back which is why it is important to have the lid open properly. Originally, I purchased 1 mylar balloon and a dozen latex balloons; however, I soon realized that they would not all fit in the box (FYI: 8 balloons will fit in this box). In order to keep the balloons contained when the box was opened, I taped the ends of the balloon strings to the bottom of the box. I used some ribbon from the dollar store to close the box and a bit of scotch tape to keep the ends shut. At this point, I was the only person who knew what they were having and didn’t want anybody peeking. The time came to open the box! It’s a Boy! The balloons didn’t quite flow out of the box as well as I had planned, and were a bit stuck so using 6-7 balloons might have been better. Kevin and Renee were definitely surprised that it was a boy, I LOVE Renee’s expression! The gender reveal box was definitely fun to make and I am excited about their newest little addition. That is such a great idea! I love this! I do love the balloon idea a lot. When I was pregnant with our second child, we had a gender reveal party and did the cake for the reveal. I love seeing all the different ways people get creative with these. However, with our third child, I decided to skip any type of baby shower and we found out the gender at birth. I’m making one of these for a friend this week and was wondering where I can print the colored helmets? It’s a football party so Its 2 perfect! I believe that the helmets were some clip art that I found in Microsoft Word. I then tinted the image to to he two colors. This is such a creative way to have a gender reveal. You did a great job capturing their surprise as well. Thanks for sharing! This is such a cute idea – thanks for sharing it with us at Inspire Me Monday at Create With Joy! Aw. I love the look on her face, too. Such a special time. This is a great way to find out,, too. Love it. Thanks for linking up at #SaucySaturdays. It definitely will fit through a door. The box is originally a moving box and I think it is 2 feet square. It might be a little tight to put into a car door so you would probably want to put it in the trunk. 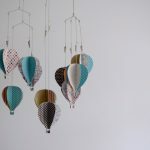 I’ve seen this balloon box idea a lot over the past year or so from friend’s. Definitely cute! 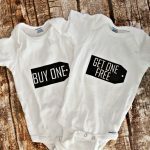 This is cute…I have a friend planning a gender reveal party in the next few weeks or so. I will share it with her! 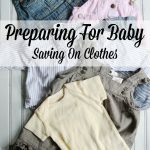 Thanks for joining the Family Joy Linkup! This is such an adorable idea! Thanks so much for sharing it with us at Share The Wealth Sunday! Thanks for sharing this wonderful idea with Turn It Up Tuesday. Love it!! This is so fun!!! Very creative! Thanks for sharing with us at Throwback Thursday!! Cute idea! Pinned. Thank you for sharing on Merry Monday! Hope to see ya next week! i have a question wear do you get the ribbons like that ?